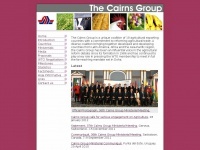 The Cairns Group is a coalition of 19 agricultural exporting countries which account for over 25 per cent of the world's agricultural exports. The web server used by Cairnsgroup.org is run by Commonwealth Department of Foreign Affairs and Tra and is located in Canberra, Australia. The server runs exclusively the website Cairnsgroup.org. A F5 BIG-IP® server hosts the websites of Cairnsgroup.org. For managing the data of the webpages the CMS DotNetNuke is used. The website uses the latest markup standard HTML 5. The website does not specify details about the inclusion of its content in search engines. For this reason the content will be included by search engines. The visitors are redirected to the homepage of the website "/pages/default.aspx".